Historical Footnote: On March 1st 1945, did Lothar Sieber become the first person to break the sound barrier? Yes, it’s true, Chuck Yaeger probably wasn’t the first person to break the sound barrier in manned flight. On a cloudy day in 1945, accomplished test pilot Lothar Sieber flew a Natter (Viper) interceptor at an average speed of 800kph (500mph,) almost certainly breaking the sound barrier during his brief flight’s full powered descent. I love little footnotes in history like this. I’d heard of the Natter before, but hadn’t known that an actual test flight had been conducted. So what was the Natter Interceptor, and how did Mr. Sieber get his footnote in history? Well, it all started in World War Two Germany. By 1944 things weren’t going very well for the Germans. The Russians were advancing from the East, the Allies had landed in France. And in the skies of Germany, the Allies were bombing at will. The Germans were especially desperate for some means to attack the American daylight bomber fleets. Modern fighter planes is the obvious answer, but early in the war Hitler had cancelled fighter development. Fighter development had been frantically restarted two years later, but it was too late and Germany’s second generation fighters were still just starting to get into action. And fighters require well trained pilots, and again (the discerning reader may have guessed this already,) Hitler had forbade any increase in fighter pilot training until way too late. And lastly of course German industry was suffering from shortages of all kinds now, and fighters require a lot of specialized parts and construction. No, it was too late for fighter planes to save Germany. The Nazis needed something cheap, easy to use, and available now. Thus, among many other basically crazy ideas, the Ba 349 Natter interceptor was designed and tested. And what was the Natter interceptor? 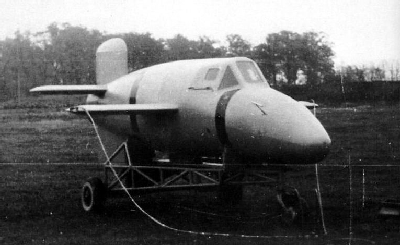 It was a rocket powered interceptor built primarily out of wood. It used a liquid fuelled rocket aided by four solid fuel booster rockets to take off almost straight up using a launching tower. It would travel at the then unprecedented speed of up to 1100 kph (685 mph) and be radio guided from the ground to the vicinity of an American bomber formation. There the pilot would take over, point his aircraft toward the bombers, and fire a bundle of 24-33 rockets. Then he and the rocket motor would bail out and return to earth by parachutes, while the wooden aircraft body would be ditched. Or even crashed into a bomber just after the pilot bailed put. It was actually a pretty clever design. An engineer’s solution to a complex problem. The Natter would be cheap, easy to build, and could be flown by people with only rudimentary flying ability since the takeoff and flight to target was controlled from the ground, and there was no dangerous landing to worry about. If the idea had proved workable, key installations all over Germany could be cheaply protected by these “pop up” interceptors, and there would be little the Allies could do to defend against them as they flew way too fast for the American Mustangs and Thunderbolts to chase. So, on its one and only test flight, what happened? Well, our distinguished Lothar strapped in. The rockets successfully fired flinging Lothar skyward. And that’s when things started to go wrong. One of the four solid fuelled booster rockets didn’t detach after firing as planned. This basically made the aircraft almost impossible to control. At some point Lothar started to bail out, but apparently was ordered via radio not to. It’s a little unclear exactly what happened, but the aircraft continued under full power, Lothar was unable to regain control or bail out, and he impacted the ground at what may very well have been a supersonic speed. And that was that. Poor Lothar may have broken the sound barrier, but it couldn’t be definitively proved…and he hadn’t survived the landing. No laurels for him. His ignominy gets worse. They could only find a few pieces of him at the crash site. An SS officer’s dog was however finding and, um, eating small bits of cooked Lothar. The officer thought it was funny, some of the other people on the crash site were horrified. A scene ensued that apparently involved the dog being struck by a shovel. The officer was not amused, but was dissuaded from pressing charges. Yes, such is war. As an experienced test pilot hadn’t been able to control the craft, it was wisely decided that barely trained pilots wouldn’t work. The program was cancelled. The Luftwaffe went with an alternate Volksjäger (people’s fighter) design, a jet interceptor built of plywood and baling wire in people’s garages. The Volksjäger didn’t change history either, but that’s a story for another day. Only a handful of Natters were built. Most were destroyed. A few are preserved in Museums. Lothar Sieber‘s remains were buried with military honours a few days later on 3 March 1945. He was 22 years old. Less than two months later Hitler was dead and the Third Reich was history.